It is my turn today to show my project for the Enter If You Dare Blog Hop. A big thank you goes to Marian of Seams To Be Sew for organizing it and for inviting me to participate. This is my first blog hop but definitely not my last, I had a lot of fun coming up with a project for today. We had our quilt show here in town on Friday and Saturday, and I was busy both days as a vendor selling patterns and also as a guild member helping with the set up, so I didn’t want to do a big project and considered a mug rug. But inspiration doesn’t work that way… When I thought of doing something with shadow pumpkins on an orange background I realized that I wouldn’t be able to include a lot of detail in a mug rug. Okay, it would have to be a wall hanging instead. The pumpkins are based on actual pumpkins that my husband carved a few years ago, so the project is a family effort. I played around with the layout, and then the name “Stack O’ Jacks” suddenly popped into my head. I thought it was funny, so I stacked the pumpkins on top of each other and decided to keep them that way. Heute bin ich an der Reihe, mein Projekt für den Enter If You Dare Blog Hop zu zeigen. Ein großes Dankeschön geht an Marian von Seams To Be Sew für die Organisation und die Einladung, daran teilzunehmen. Dies ist mein erster Blog Hop, aber ganz sicher nicht mein letzter, ich hatte viel Spaß daran, mir ein Projekt hierfür auszudenken. Wir hatten ja am Freitag und Sonnabend unsere Quiltshow hier im Ort, und ich hatte dort einen Stand, um Patterns zu verkaufen, und gleichzeitig bin ich auch Gildemitglied und habe beim Auf- und Abbau geholfen. Daher wollte ich kein großes Projekt planen und dachte erst an einen Mug Rug. Aber wie das so ist mit der Inspiration, sie geht ihre eigenen Wege. Ich hatte dann die Idee, Schattenkürbisse auf einen orangen Hintergrund zu legen, und mir wurde schnell klar, dass ein Mug Rug zu klein ist, um dort ins Detail zu gehen. Also mutierte der Entwurf zu einem Wandbehang. Die Kürbisse basieren übrigens auf echten Halloween-Kürbissen, die mein Mann vor ein paar Jahren geschnitzt hat. Während ich mit verschiedenen Entwürfen herumspielte, fiel mir plötzlich der Name “Stack O’ Jacks” für das Muster ein, und das fand ich lustig, also stapelte ich die Kürbisse aufeinander. (“Stack” bedeutet Stapel, und Jack ist hier die Abkürzung für Jack-O’-Lantern, so heißen die geschnitzten Kürbislaternen auf Englisch). Zur Feier meines ersten Blog Hops ist die Anleitung für “Stack O’ Jacks” bis Halloween als kostenloser Download verfügbar. Im November verschiebe ich das Muster dann in den Shop, bei Interesse also bitte gleich herunterladen. In meinem Kürbisstapel sieht man die Stiele der Kürbisse zwar nicht mehr, die Schablonen in der Anleitung sind aber für die vollständigen Kürbisse. Wer sie also nicht stapeln möchte, kann leicht einzelne Blöcke daraus nähen und anders anordnen, es sind viele Variationen möglich. EDIT 1. November: Die Anleitung ist jetzt als Kaufmuster im Shop verfügbar. To celebrate my first blog hop I will have the pattern for “Stack O’ Jacks” available for free download until Halloween. In November I will move it over to the shop, so be sure to download it right away. 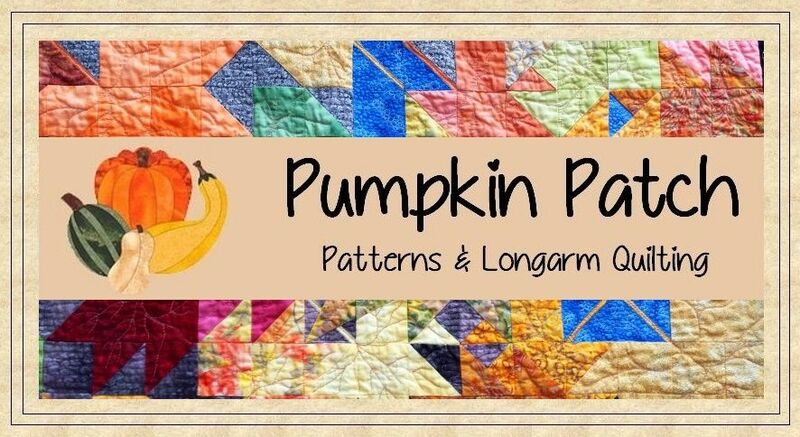 Although the stems of the pumpkins are not visible in my stacked version of the design, the templates are for the whole pumpkins, you can easily make them as individual blocks and even turn them into a table runner. Or just pick one and turn it into a pillow. The possibilities are endless, and I hope you will enjoy this project as much as I do. EDIT Nov 1: The pattern is now available for purchase, either here or on Craftsy. And now it’s time for the giveaway! This is organized by Marian and she makes the rules, you can find them at the bottom of this post. Our sponsors are Fat Quarter Shop with a $75 gift certificate and Timeless Treasures, they donated five lovely fabric bundles. A big thank you to both companies for their generosity. Es gibt auch Preise zu gewinnen! Die Verlosung hat Marian organisiert, und sie stellt auch die Regeln auf, sie sind am Ende dieses Posts zu finden. Sponsoren des Blog Hops sind Fat Quarter Shop mit einem $75-Einkaufsgutschein und Timeless Treasures, die gleich fünf Stoffpakete gespendet haben. Herzlichen Dank an beide Firmen für ihre Großzügigkeit. Hinweis: Die Portokosten für den Versand der Stoffe müssen vom Empfänger getragen werden. And last but not least, here is the full schedule, be sure to visit all the participating bloggers to see their fun Halloween projects. All winners will be announced on October 25, 2017. Winners are expected to pay shipping costs for the product they won. In some cases, you will be asked to comment on the blog to enter the giveaway… do the right thing and thank them for the time it took to create the pattern, thank them for the pattern and… Thank the sponsor by buying their products for the giveaways. This helps them continue to offer great prizes for these types of events. You can also comment on their social media pages. Even if you don’t win, letting them know you love their products is a huge incentive and they really do love hearing from you. I love your pumpkins, stacked or individual. Thank you, Christi, and thanks for stopping by! Thank you, Betsy, you are very welcome. Thank you for the pumpkins pattern. My grandson loves it! I love your Stack O’ Jacks Banner! Thanks so much for the pattern! You are welcome, Susan, and thanks for stopping by. Very cool project!! Thanks for sharing!! Thank you, Alida. Yours too… I just took a quick look last week, I had no time with the show this weekend. I will catch up today. Thanks for stopping by. I love the wall hanging and the variations you suggested! Thank you, Elizabeth. I will be over for a return visit to your project later today. I love your Stack O’Jacks! They really do look like their “ancestors.” Thank you so much for sharing your creativity. Thank you, Allison, I am glad you like them! I love your stack ‘o jacks—they are so much fun! You are welcome, Liz, and thank you for taking the time to leave a comment. I love your pumpkin designs and the fact that you used something from your family memories to keep it alive. Great job. Thank you, Nancy. I figured there was no need to reinvent the wheel since my husband’s designs looked awesome. The vampire is my favourite. Thank you, Karen, and thanks for stopping by and leaving a comment. This one is my favorite today! Thank you, Cindi, I am so glad you like it! The stacked jacks are great! Thank you, Anita, and thanks for stopping by. Thank you, Tami. That’s “Third Weekend in October” by Ruth Powers, the first quilt pattern I ever bought. I was completely in awe and thought I would never be able to make it 🙂 I love that quilt very much. Thank you, Joan, I am glad you like them. I would love to see a picture if you make something from the pattern! Great designs on those pumpkin faces. Thank you, Rosalind, I will pass the compliment on to my husband. Those pumpkins are just toooo cute. Thank you for the pattern. You are welcome, Margaret, and thank you for stopping by and taking the time to comment. Love the personalities of your Jack o Lanterns. Thanks for sharing. Thank you, Laura, and thanks for stopping by. Love your stack o jacks. You did a wonderful job. Love the orange and black. Your husband did a great job making his jack o lanterns too…Thank you very much for the free pattern . Thank you, Tammy, I am glad you like the pattern, enjoy! You are welcome, Lori, thank you for taking the time to comment. Thanks for the pattern – alaready downloaded it! Great design! Thank you, Allison, I am glad you like it. The pumpkin Stack is a winner! Thanks for stopping by, Darlene, and for taking the time to comment. Thank you, Carol, and I am sorry that you had so much trouble trying to leave a comment. My apologies again! Love your jack o lanterns! Thank you for sharing. Thanks for stopping by, Teri, I am glad you like my design. Thank you, Angela, you too! How great that you were able to use actual pumpkin models! I was looking for a vertical pattern – thanks for sharing! Yes, I thought they were perfect for a quilt. Thanks for stopping by, Cathy. Wonderful pattern — thanks for making it available to us. My pleasure, Nancy, I am glad you like it. I love your pattern and your clever name for it! Thanks so much for sharing. Looks like your husband has some great carving skills. I know, right? It made the design part very easy for me. Thanks for stopping by, Lisa Marie. Awesome wallhanging! Love how you used the faces from pumpkins your husband carved. Great idea. Thank you, Jan, I am glad you like it. Love your wallhanging! I must make this! Thank you so much for the free pattern! You are welcome, Charlene, thanks for stopping by. Love your Stack of Jacks! Great wall hanging and family project. Thank you! Thank you, Wendy, for stopping by and leaving a comment. Wow, your husband is a very talented pumpkin carver! And you are a talented quilter..just delightful. And thanks so much for generously sharing your creation and the pattern! Thank you, Nancy, I will pass your compliment on to him. And thank you for your kind words about my work as well. I love your pumpkins! Thanks for sharing the pattern. You are welcome, Sandi, thanks for stopping by. Thank you so much for the table runner pattern. Love the jacks!! Thank you, Janet, I am glad you like them. What a great project for your first blog hop. Love that it is based on real carved pumpkins. Thanks for stopping by, Frances, and for taking the time to comment! I love the faces on your pumpkins. Thanks so much for sharing. You are very welcome, Vicki, thank you for taking the time to leave a comment. I love your stack of jacks. They are sew cute. I also love the versatility of them. Thank you. Thank you, Melany, I am glad you like them. Love your Stacked Jacks. They are so much fun. You are welcome, Sue, and thanks for stopping by. Oh my! These are just wonderful! Thank you so much for the pattern! Love them!!! Thank you, Barbara, I am glad you like them, enjoy! Very cute! I love your Stack of Jacks! Thank you for sharing your project and the pattern. Thank you, Cecilia, for stopping by and taking the time to comment. Very talented pumpkin carving, I’d say! Thanks for the pattern. Yes, Mary, he is talented for sure. Thanks for stopping by! You are very welcome, Anna, I am glad you like them. What a cool project! It is so unique and creative! Thank you for the pattern…I will enjoy making it! Thank you, Kathy. I would love to see a picture if you make them! Thank you so much, Beatrice! That is the cutest Jack O’Lantern grouping ever! I like it both as a square and as a runner. Now you are making me blush… thank you, Susan, I am glad you like them. Oh golly those pumpkins have SUCH personality! They are so fun and adorable. Thank you for sharing your creativity. You are welcome, Melody, and thanks for stopping by. Love pumpkins, and yours are fantastic. Thank you so much, Marti, I am glad you like them. What a fun idea, to memorialize a family Halloween event. Thank you for sharing with us, both the story and the pattern. You are very welcome, Beth, thanks for stopping by. Haha, they sure do, Shirley. Thanks for stopping by. Thank you for this clever pattern.I enjoy all your work. You are welcome, Robin, and thank you for your kind words. Scary pumpkin faces, love it! Thanks for sharing. Thank you, Theresa, and thanks for stopping by and leaving a comment. You are welcome, Sandra, thank you for the visit. You are welcome, Bonnie, I am glad you like it. Thank you, Sandy, you are very welcome. Thank you for sharing! Love your spooky projects! Beatrice, I love the stack’o’Pumpkins. As popular as silhouettes have become, this is a lovely way to display the pumpkins. I love them on the orange background. I will definitely make this pattern and thank you so much for the pattern. Thank you, Marian, for inviting me to participate and for all the work you did to make this possible. It was a lot of fun! what a cute idea and with jack-o-lanterns you can make them as unique as you are! Thank you for stopping by and taking the time to comment, Jacob. Thanks for the pattern! I really like this stacked pumpkins project! You are welcome, MoeWest, I am glad you like them. Very cute! Love the stacked pumpkins. Thank you, Sharon, I am glad you enjoy them. You are welcome, Lori, and thank you for being so enthusiastic. Your Stack of Jacks is adorable! Absolutely love this project! Thank you, Lynne, and thanks for stopping by.